Frugal Tips to Tighten Your Budget. 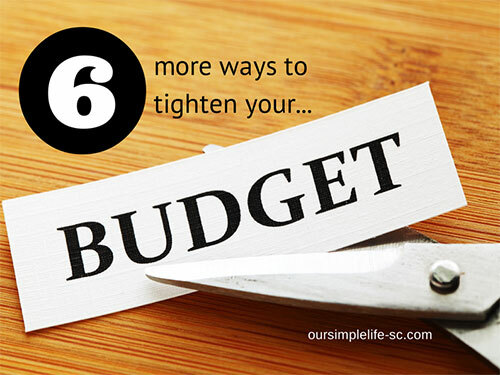 Have you ever thought that there must be more you can do to tighten your budget? If you are like me I know I do all the normal things like using coupons, unplug unused appliances, get rid of the cable and grow my own vegetables, but I still think there must be more I can do. Since we are a few weeks away from taking our two income family down to a one I needed to make sure I am doing everything I can to be a good financial officer when it comes to our monthly income. My hubby works long and hard to provide for us so I want to make sure I am doing everything I can on my end. I have had a frugal spirit for years, so all the normal money saving tips and ideas I already have in place. So I sat down and thought long and hard about all the things we do on a monthly basis and where else I might be able to cut back. I was able to find six more things I can do to save a few extra dollars each month. Rewards Credit Card – We do not use credit cards but if I wanted to enjoy an evening out or an overnight stay I was going to have to find a way to pay for it. We switched our emergency credit card to one that pays us rewards in restaurant gift cards and free hotel stays, so now if I want to do something special I will use the points from our rewards card. Trash Bags – I stopped buying paper products years ago but still bought toilet paper and trash bags, until the other day when I noticed how many 50# feed bags I go through in a month. They can easily be used as trash bags and since we recycle, burn papers and compost we don’t thrown anything messy in the trash so these bags can be re-used a few time before they need replaced. Hello Library – Even though I love my Kindle books if I go to the library I can borrow for free…and that is a no brainer. One Trip Shopping – Planning and organizing everything I need for the week into one day will be a challenge, but in the long run it will save gas and wear and tear on my car. Cutting More of the Electric Bill – There are still things I can do to lower our electric bill. Listen to the radio when I am on my computer instead of turning Pandora on through the TV. Bake Once a Week – Plan ahead and bake all bread and desserts in one day will save a great deal of propane by not heating up the oven each time. What I don’t want is for us to feel we are depriving ourselves by tightening our budget, so if I can save even a few more dollars each month it will free up the extra money to spoil ourselves on something frivolous every once in awhile. You’ll get the hang of doing all your shopping and errands in one day in no time. I’ve been doing it for years since that was the way my Mom did it and also out of necessity since being on the road and we’re staying so far away from the nearest town. One of my goals is to actually go to town twice a month for two reasons, we’re down to one vehicle now and two, I find that the fewer times I’m in town the more money I save. And, it has encouraged me to get creative in the kitchen and learn to use what I have on hand. But, the problem I’m having with shopping only twice a month is storage issues. As you well know, storage space in a fifth wheel can be tough. So, I’ll be working on two weeks of meal plans that use similar ingredients then creating a new dish with the leftovers. Sorry, I’m rambling. I think that will be my biggest challenge since I am used to driving into town everyday to go to work, so stopping at the store on my way home has never been an issue. Fabulous ideas! Everything will add up! Thanks Daisy…I agree every little saving will add up at the end of the month. A credit card that pays you money back…that is great! I am excited every time we earn enough points to get a free dinner out but now I am already saving our points for Christmas shopping with earned Amazon dollars. We use the point earning credit card for everything during the month and then pay it off before the due date each month. We have to be real careful we don’t change our spending habits and are very faithful in paying it off in full each month so we don’t get any extra finance charges. Little things always add up and before you know it those small changes make big results! I never thought about doing all the baking at one, due to propane costs!! Hummmm, great idea. I don’t think I’ll be able to get a way with once a week, but maybe twice a week. I had never really gave it much thought either but once I started to watch how many times during the week I turn the oven on, it just makes more sense! Great tips! I’ve just become a Stay At Home Mom, which means we are a one income family for the first time ever, and my first time since I was 14 not having “my own” income. We have always lived below our means for the most part which helps, but I can use all the tricks I can get my hands on to free up some money for small luxuries and avoid that feeling of deprivation. 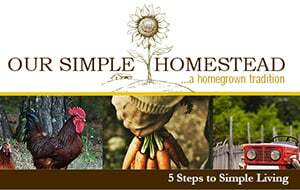 Thanks for sharing at the Homestead Barn Hop! I use the blogs I read as a great resource and love to share my own tips and ideas. You don’t think the little things you do matter but the all add up. Good luck on your journey! I LOVE your blog! So happy to have met you today and thankful you stopped by my blog. I tried to list my blog on your directory, but I couldn’t get it to go through without having to enter my financial info. (even though I only chose the FREE option, without adding the social media). I am not sure what I am doing wrong…would love to list it here. Anyhow, I am grateful for your wonderful ideas and the wealth of advice I am finding here. God bless you!! I have been to your blog and enjoyed reading all about you as well! As a librarian I gotta say – Thanks for mentioning the library! So many people forget that they are already paying for the resources their public library provides through their tax dollars – they may as well take advantage! We have popular new releases (that you need not buy, if you’re only going to read it once, right? ), movies, ebooks, music downloads, magazines, etc. So much free education AND entertainment to be found at your local library it’s a shame to not use it! We love the library and I am teaching my grandchildren to love it as well! I need to work on the one trip shopping. Honestly, I spend more the more trips I make to the store! I must stop going. Plan ahead, make a list, etc. Great post! Thanks! That is way area I need to work on as well. Not driving into town everyday to go to work will be an adjustment for me but in the long run I will save so much money from only going once a week. The library saves us tons of money. We make good use of the movies to keep the kids watching new and different things. Also our library has access to e-books and audio books. That way you can still use your tablet but get your books for free. I love my library time! Great idea about the feed sacks! I hadn’t thought of that! Thank you for sharing on the Art of Home-Making Mondays 🙂 Your posts are always helpful! I always try to find other way to re-purpose things before I throw anything away so the feed sacks were a great find for me! Found you on Fabulously Frugal Thursday Linkup. Great tips! We had to figure out ways to save before switching to one income and later when anticipating a job loss. But even though, my husband is working again, I’m still all ears when it comes to finding out about more ways to save. I love trying to find new clever way to save even a few pennies so I enjoy being able to pass them on to everyone! Such good ideas -The baking once a week is a good idea especially in the summer when you can pick a cool day. I borrowed a kindle book from our library’s website this morning. All of my books on my kindle our “free” books (I happen to list some on my blog every morning). I have not checked out any free book on my Kindle at our library but I am going to check that out! Thanks for telling me about that.